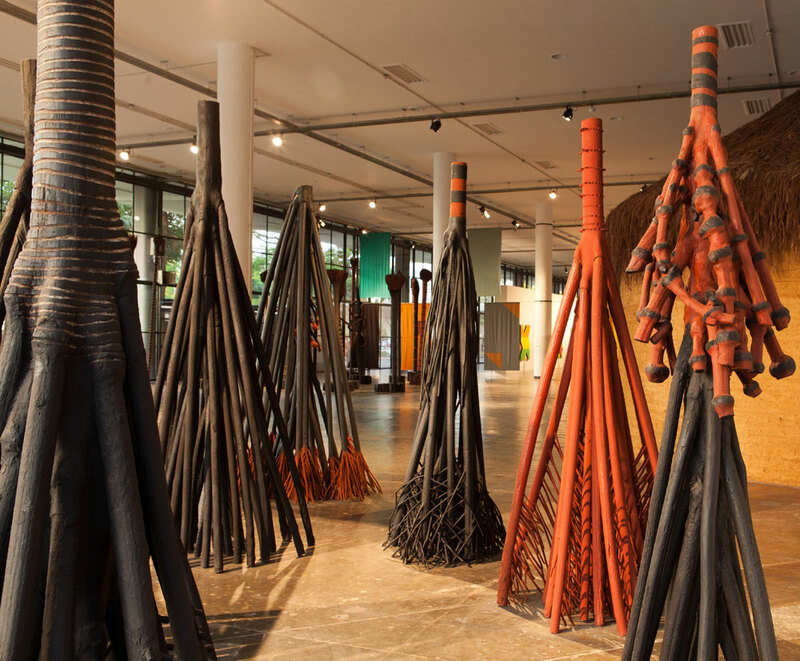 In his artistic and ecological experience, which is marked by his decision in the 1970s to establish residence in Nova Viçosa, Bahia, Frans Krajcberg finds in the diversity and exuberance of the flora, the raw materials and plasticity that qualify and compose his sculptural work, as well as his prints, paintings, drawings and photographs. The use of nature as theme and material for his works is consistent with his defense of the environment. Among the numerous works developed throughout his career, three sets of sculptures – dubbed Gordinhos, Bailarinas and Coqueiros – gain prominence in the exhibition space of the Bienal’s modernist pavilion by occupying part of the ground floor and creating a transitional environment between the park’s outdoor area and the building’s interior. Remnants of charred wood, trunks, vines and roots are transformed through whittling, carving, decomposing and painting. Emerging from this labor, these selfsupporting pieces of varying scales and dimensions are created and then arranged amidst the rational elements of this monumental architecture.